I can't believe that it's April already! Anyone else having a hard time believing it? With April, of course, brings Easter. We don't really do a whole lot for the holiday, except go to a breakfast at my husband's grandparent's house. Although, this year, they are doing it after Easter, so we are able to do our own thing. I am envisioning egg dying, easter-themed baking and hopefully enjoying some warmer temperatures. Since many of you, I am sure, are menu planning for the day, I thought I'd share a dessert that would be a wonderful addition for the day. 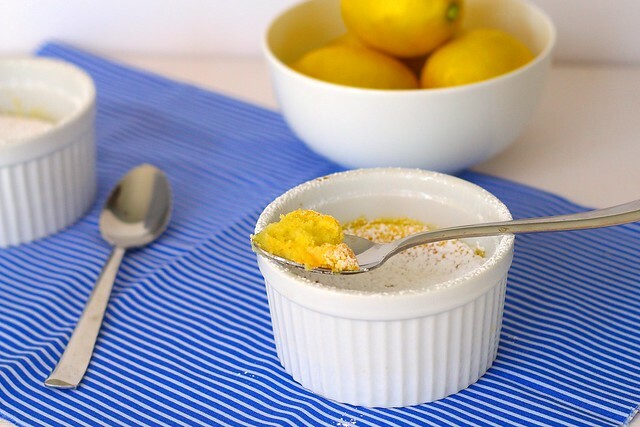 This lemon pudding cake is light, bright and delicious, but still boasting in flavor. The whipped eggs, combined with sour cream makes for a fluffy treat. The lemon really shines through with the fresh juice and zest used. This is perfect to bake as individual desserts, or to make in one large dish to place on the table for everyone. Preheat the oven to 350ºF. 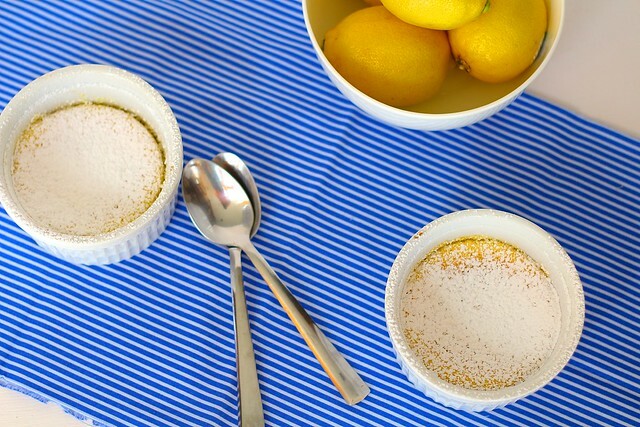 Grease a 1-quart soufflé dish, or several small ramekins and place them in a pan with 2-inch sides. Have ready boiling water for the water bath. In the bowl of a stand mixer fitted with the paddle attachment, beat the butter at medium speed until light and fluffy. Add the sugar and lemon zest and beat until combined. Add the egg yolks, one at a time, beating well after each addition. 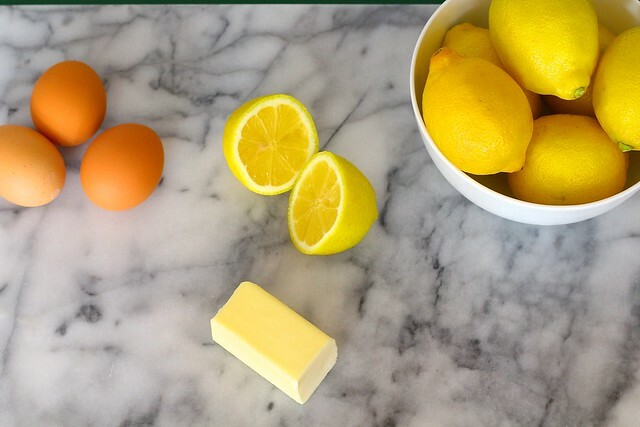 Reduce speed to low and add half the lemon juice, half the flour and half the sour cream and beat until smooth; repeat with remaining lemon juice, flour and sour cream. In a separate stand mixer bowl fitted with the whisk attachment, beat the egg whites at medium speed until foamy. Increase speed to medium-high, add the salt, and beat until stiff peaks are formed. Add one-quarter of the whites to the lemon mixture and gently fold in. Continue to fold in whites one-quarter at a time. Pour into the prepared soufflé dish or dishes. Carefully pour boiling water around the dish(es) to a depth of 1 inch. Bake for 50-60* minutes or until slightly golden brown and the center is just set. The cake should spring back when gently touched. Do not open the oven door while the cake is baking or the cake will collapse. Remove from the water bath immediately and cool on a rack for 10-15 minutes. Lightly dust with powdered sugar. Serve warm. *If using individual dishes, reduce the baking time to about 45 minutes, but keep a close eye on it.